Over 5000 UK companies are currently doing business with UAE. As UK businesses begin to reap the rewards of such a booming and affluent marketplace, re-export opportunities to the £150 billion regional market is becoming an even bigger pull. If you’re thinking of exporting to the UAE here are some things you need to know. Businesses and individuals wishing to import goods must be registered with the UAE customs Authorities and hold a trade licence. Once registration has been processed you will be assigned an Importer/Exporter Code number which you should quote on all documents presented to UAE customs. The majority of goods may be imported without a licence. All goods must be declared to Customs on leaving the EU. Due to security measures in the EU all shipments leaving the EU require a pre-departure message to be sent to the destination (also known as ECS export control systems). For goods that are exported to non EU member countries an Export accompanying document EAD must be used to comply with customs cargo security, but it can also be used as the exporter’s official evidence of export. Certificate of Origins can sometimes be required for certain products, however the exporter should verify whether this is needed with the buyer. The GSO (Gulf Standardization organisation) set requirements for UAE packaging and labelling. They outline that for all consumer products labelling in Arabic is required and a number of products must clearly indicate country of origin. 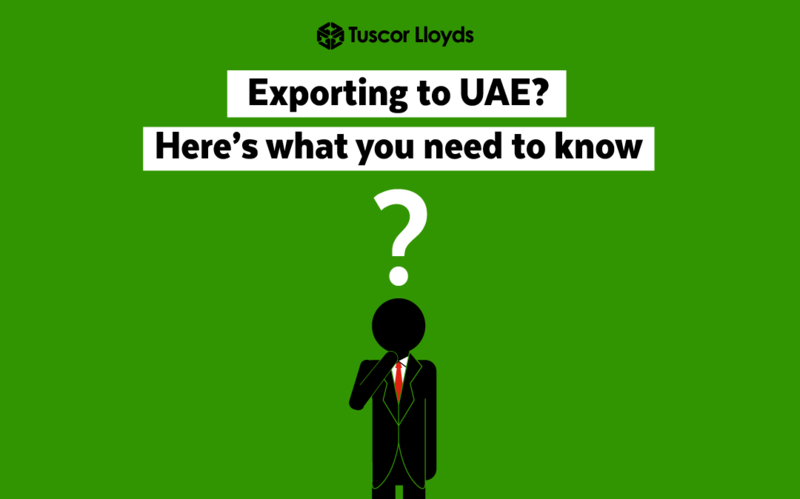 For more information on exporting from the UK to UAE or to get a quote for shipment of your goods please contact Tuscor Lloyds: +44 (0) 161 868 6000 /shipping@tuscorlloyds.com – our professional staff can help you with every aspect of exporting from the UK to UAE.